The Glastonbury Festival is the biggest outdoor performing arts and music carnival in the world. The venue of this lively event is Pilton in Somerset, England. The spotlights for the Glastonbury Festival 2017 are U2, Coldplay, and Beyoncé. Viewers will enjoy a wide variety of music such as World, Rock, Reggae, Electronic, Hip Hop, Folk, and Dance. The Glastonbury Festival, or the Glastonbury Festival of Contemporary Performing Arts, is the biggest outdoor Greenfield performing arts and music carnival in the world. This carnival is mostly famous for modern music. However, it also organizes slapsticks, dance, theater, floorshows, circus and other forms of art. In Glastonbury Festival 2005, there were more than 385 live concerts and the carnival was held at an enclosed space of more than 900 acres. Approximately 150,000 spectators attended the event. In the 2007 Glastonbury Festival, more than 700 plays were staged on more than 80 arenas and the number of audiences increased to 177,000. It is an annual festival, barring every 5th year. 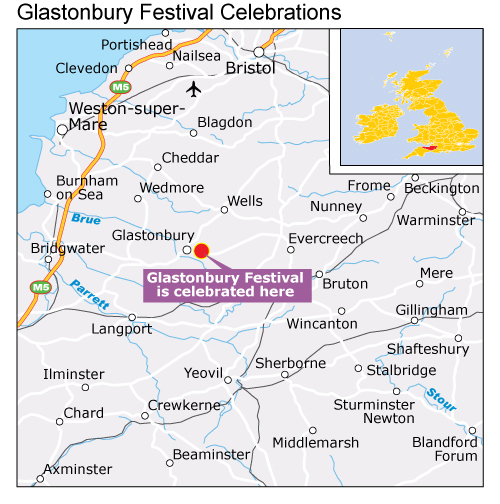 The Glastonbury Festival 2011 will be held from June 22, 2011 (Wednesday) until June 26, 2011 (Sunday). All the Glastonbury Festival 2011 tickets ran out of stock within 4 hours of putting them on sale on October 3, 2011 (Sunday). Glastonbury was significantly swayed by the free festival campaign and hippie culture in the early 1970s, starting with the Isle of Wight Festival. This festival featured shows by The Who, among other performers. Subsequently, the arranger of the event, Michael Eavis said that he made a decision to organize the first carnival, then known as the Pilton Festival, after he watched an outdoor Led Zeppelin feat at the Bath Festival of Blues and Progressive Music at the close by Bath and West Auditorium in 1970. The carnival has held on to the traces of this culture like the Green Fields zone, which incorporates the Healing Field and Green Futures Field. The venue of the festival is Worthy Farm in Southwest England. The Worthy Farm lies in the middle of the tiny villages of Pylle and Pilton, six miles east to the Glastonbury town. The Glastonbury Tor looks across the venue in the magical "Vale of Avalon". Tipis are used as accommodations in Glastonbury for an extensive period. A small number of fixed Tipis are available for rent at Tipi Field, close to the Stone Circle. Up to six adult individuals can live in a Tipi. The rate of booking a Tipi is around ₤900 and this is over and above the standard price of admission ticket. Majority of people attending the Glastonbury Carnival live in a tent. There are various camping places and each has its own ambience. Camps for the physically challenged are also available in the Spring Ground. Camping accommodation is available at the price of a standard admission ticket of the festival. However, the attendees should get their own tents/camps. Some people go for the motorhomes to cherish the carnival or bring their own motorhome or recreational vehicle for camping if they have one. Luxurious beds are available in motorhomes and the travelers are saved from probable rains. A caravan ticket can be bought in addition to the festival ticket. The cost is £75 per caravan this year. A caravan will have to be hauled by a van or any other car. Visitors are allowed to bring a trailer tent on the caravan spot. The visitors can also stop over at any of the regional bread-and-breakfast venues. However, most of them are not located close to the venue.